I was in Grand Rapids looking for a bag yesterday when I got a call from Maddie Shiels on the Symetra Tour. They’re playing in South Bend and she wanted me to work for her. I agreed but with one caveat. I was paid in full at the Motel 6 and had to get at least a partial refund or I would stay the entire week. Then another call came in. A caddie was looking for a room at the 6 but misplaced his drivers license and they wouldn’t let him check-in. I offered my room at a discount and the deal was made. Minutes later I was off to South Bend. 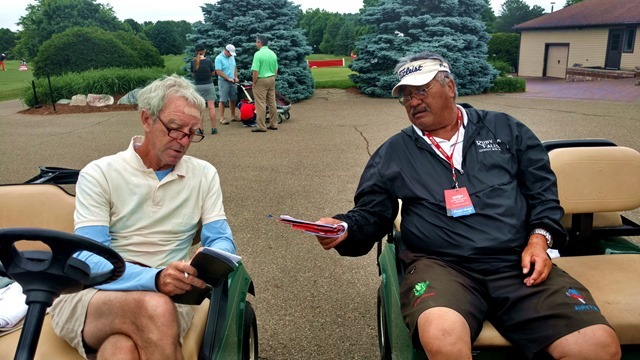 Before leaving Blythfield Country Club, I captured these two seasoned loopers checking notes on their yardage books. Upstate Jay was describing the “thick hollow” (a term only a student of golf course architecture would use) that lies over one of the greens. Upstate is working for Maude-Aimee Leblanc and Bully for Lisa Ferraro. I noticed Cindy Feng has not teed it up since Dallas. Wonder what happened? I walked the back nine this morning and when Maddie arrived, we played the front. She had one of those travel nightmares one tries to forget but arrived only a couple hours later than scheduled with not much sleep. There was a hole in the Symetra schedule the week of September 12-16 but not anymore. They play in Garden City Kansas the week prior and believe it or not, the new tournament is in the same city! WHAT? Back-to-back back events in America’s heartland. 🙂 The first is four days and the second three on a different course. Garden City is OK but after two straight weeks, I think you become an honorary citizen with voting privileges. 🙂 Talk about getting away from it all. Yikes! This entry was posted on Tuesday, June 14th, 2016 at 5:18 pm and is filed under Uncategorized. You can follow any responses to this entry through the RSS 2.0 feed. You can leave a response, or trackback from your own site.